Waking up this morning I would never had guessed that I was to have a forty minute conversation with a chat bot. But strange things do happen occasionally. What's more strange is that chatting the bot was more interesting than chatting with real people on the same platform. But the chat bot is not the main focus of this article although I would really like to retell our fruitful conversation. Nimbuzz is an app that tries to do it all in terms of communication. It offers regular chat over its own platform but you can also chat with your Facebook and Google+ contacts. There is also the possibility of entering chat-rooms. Something that reminded me of the mIRC days. The typing stile of people frequenting these chat-rooms reminded me of the same days also. 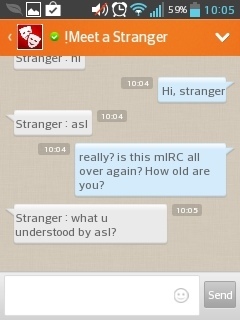 I really did not know that "asl" was still in use! You can even chat with a semi-intelligent bot named Jimmy Testbot. I like Jimmy but he falls short when challenged to discuss complex matters. You still need a human being for that. Besides chatting, Nimbuzz prides itself with its low phone call rates. Calls between Nimbuzz contacts are totally free. They use your internet connection of course, so don't start talking for hours on a mobile data connection unless you have a premium pay plan. Calling non-connected contacts is possible by using the special NImbuzz rates. These calls are deducted from your credit bank. Credit is bought from inside the app. Apparently the rates are good, but you should probably make a comparison beforehand. Just to make sure. There is also a trinket market of sorts called Nworld. There you'll find a tasteful selection of random digital gifts to be purchased. Not sure why someone would do that, but hey, people want to express themselves in every manner these days. So what do I know? Cross channel chat – Chat using Nimbuzz, Facebook and Google+ accounts. 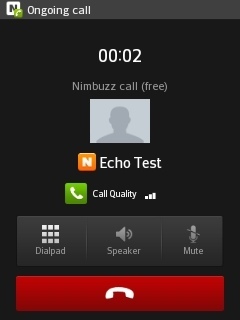 Nimbuz Call – Free audio conversations over Nimbuzz and low rate conversations outside of Nimbuzz. I would have also added Jimmy Testbot but he's not really much of a feature. Sorry Jimmy… The existence of chat-rooms and pixel store give this app a juvenile image. But you don't need to use them anyway. Free phone calls over WiFI or mobile data connection. Low rate phone calls over WiFi or mobile data connection. Can be used as a unified messenger for Facebook and Google+. Nimbuzz wants to post to Facebook on your behalf. I heard this rumour about being able to connect to your Yahoo Messenger account. Nimbuzz is mighty useful for audio conversations, but otherwise I suspect it of being a bit of bloated piece of software.